The electrification of railway lines in the NW of England (and elsewhere) has been planned for some while. Money was allocated for this programme by the last government, which recognised the need to modernise regional intercity connections for both economic and environmental reasons. But in the new coalition government’s austerity-focused scheme of things it seems this plan is under threat.Recent personal experience demonstrates why action now on upgrading these lines is essential. It’s the regional economy, people’s livelihoods and issues of energy efficiency which are at stake here. Vague words of hope for the future will not do. We’ve just had a short family visit to Cornwall (no viable trains and too far to drive, so we flew), and we had to get back from Manchester Airport to Liverpool last night. When a friend dropped us off at Manchester a few days earlier, the whole journey to the Airport from our home in Liverpool took about 45 minutes door-to-door. But, scheduled on return to land in Manchester around 18.40 yesterday, we declined kind offers also to pick us up, saying virtuously that we’d take the train. Our return from Manchester home to Liverpool by train (a journey of 40 miles: single tickets about £11 each, plus taxi fare of £8) ended up taking not only three-plus times as long as the flight from Newquay to Manchester (about 300 miles, under an hour), but also three-plus times as long in duration as the 45 minute outward journey by car. Firstly, we just missed the hourly (yes, just one an hour) train, so we didn’t leave Manchester Airport Train Station until 19.41. Then, ten minutes into the route, the train stopped. Trouble on the line, came the announcement. In the end, we were on that two-carriage commuter style train not for the scheduled 70 minutes (bad enough), but more like half as much again. It was getting on for 10 pm when, three hours after arrival in Manchester, a final ten minute taxi ride eventually delivered us to our own front door in Liverpool. And now I read that the intended electrification of this desperately-in-need-of-renovation Liverpool to Manchester line is under review and may not happen. It will be very hard to believe stories of deep concern by the coalition government about cities such as Liverpool, if this ready-to-deliver rail electrification is pulled. For all the hopes and plans of Liverpool John Lennon and other smaller NW airports, most air traffic to the NW of England still arrives in Manchester; and the same applies for those who choose to let the train from London (or wherever) take the strain. 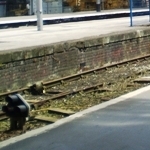 Manchester is the regional hub; the railway network needs to provide the spokes. The electrification plans now under threat have been drawn up after much debate, to meet a very serious need for proper and energy efficient connection between Liverpool and Manchester (and in fact also Halifax and Bradford). The proposals are not a fancy extra, they constitute an intended life-line to support sustainability of many sorts in the NW of England. If the government wants to make people travel everywhere by car, and not to do business across the NW beyond Manchester, this is how they can achieve it. Why should any sensible person visiting the NW choose to travel as we did last night, when they could elect to drive, or simply remain in Manchester? But ultimately not even Manchester will benefit from appalling regional rail infrastructure and extra needless car-induced carbon emissions. It’s one thing for the coalition government to talk about ‘cost-savings’, but it’s quite another to choose, surely knowingly, to stifle carefully planned, low carbon improvements to vital rail links between significant regional cities. The negative impacts of such willful neglect would be huge. The plan is on the table, so let’s get on with it. Action to deliver the proposed new train network technology is what’s now required, not just empty talk. This article was first posted on the New Start Blog on 18 June 2010. This reminds me of another electrification plan – the Electrification of the Soviet Union (great opera by the way). That plan was bold and no expense (or human life) was spared in the execution of the plan. We need the same bold and fearless central planning here in the UK!! !